Stocks and pillories were used for humiliation from the medieval times up until the early 1800s. They were used for crimes that were not considered severe, such as drunkeness and swearing. Once inside the stocks the victims were at the mercy of the crowds who would through rotten food and other items at them. The story of these begins in February 1949 by the Wootton Historical Society. The need to take action to preserve the stocks and pillory at Ozleworth from further decay was raised by them, sadly however nothing occurred. 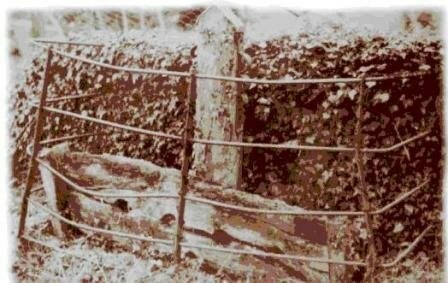 By 1995 the stocks had virtually vanished and only a few remains were left, the stocks had disappeared and the pillory now leant against a tumbledown drystone wall, almost hidden by bushes. Again the years rolled by and eventually the National Trust made replicas of the stocks and pillory. In April 2011 the stocks and pillory – not quite an exact replica of the original – were installed in front of a new section of drystone wall, built by Cotswold Wardens, on the former site beside Fernley Farm. Why were there stocks in this remote area? It is know that Newark Park Estate began in the mid-sixteenth century, and that there were several mills along the Ozleworth stream from Doomesday onwards, so there were presumably more dwelling places for workers than remain now, but stocks would seem to belong in the centre of a community. Was there a hamlet or village that has disappeared? Was the grassy site a village green? Or were the stocks originally from elsewhere? This is the puzzling part of the history of these items. Why not take a picture of yourself using these items. You are looking for a small container which is not hidden in the stocks or the drystone wall. There is no pen here so please bring your own. There are also three other caches in this area, Convergent Thinking GC4K399 OzelworthChurch Micro GCVW9M Cheeky2 GC18MMN. Why not give those as go while you are in the area. Ybbx arne jurer gur ohgerff wbvaf gur jnyy.